HARP, for High Altitude Research Project, was a study of the upper atmosphere by instruments shot from a cannon. The project was conducted in the 1960s by scientists of the McGill University in Montreal, who named their vehicle the "Martlet", an old name for the martin bird; the shield of the McGill University in Montreal displays three red martlets. The cannon which propelled the Martlet to the high atmosphere was the creation of Gerald Bull, a Canadian engineer who specialized in the design of cannon. From the US Navy Bull obtained two cannon of the type used by battleships, with a 16-inch (40 cm) caliber, and combined them end-to-end to create a single tube of nearly twice the length. 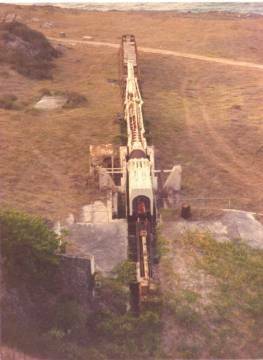 The cannon was mounted on the island of Barbados and fired nearly vertically, over the ocean. To reduce air resistance, the 200-lb Martlet vehicle was given a smaller diameter than 16 inches, with wooden blocks filling the space between it and the barrel. Because the payload and attachments were about 10 times lighter than the regular 16-inch shell, the acceleration was much larger, about 25,000 g: electric circuits had to be encased in plastic to resist the great forces. The peak altitude was extended (by 4 miles), by pumping out most of the air in the gun barrel before the shot. When the cannon fired--its loud bang was heard all over Barbados--the airtight cover over the muzzle was blown away and the Martlet rose into the high atmosphere, to altitudes of 80-90 miles. The image on the right, taken by Chris Clark, is of the gun beside the Grantley Adams Airport runway in 1986. Officially the cannon was named for the German Kaiser (emperor). Now and then it is referred to as "Big Bertha"--in German "Dicke Bertha" (Fat ("thick") Bertha). Actually the cannon which soldiers unofficially called by that name (Bertha was the daughter of the armament manufacturer Krupp from whose factory both guns came) was a giant mortar, a short-range siege gun capable of hurling 420-mm shells weighing close to a ton. In World War II the Germans also built a "supercannon", at Mimoyecques near Calais, the French port closest to England. Elaborate underground tunnels were built for 25 barrels in clusters of 5, 420 feet long, all aimed at London. The British air force observed the construction at Mimoyeques and sent bombers to attack it, but the construction was too deep (105 meters or 340 feet) for bombs to reach it. The guns were finally disabled by 5-ton "Tallboy" bombs developed by Barnes Wallis, an extremely creative British engineer. Dropped from high altitude, they penetrated deep before exploding and created an "earthquake" shock in the rock. These bombs (also used on other "hard" military targets) sealed the entrances and stopped all work on the cannon. Shortly after the end of the war the British army blew up all entrances, but parts of it were re-opened and can now be visited by tourists. That attack took place on July 6, 1944, shortly after the allied invasion of Normandy. The US air force meanwhile had an alternate plan involving a radio-guided B-24 bomber loaded with explosives. The attack was launched on August 12, 1944. A pilot guided the take-off and was supposed to parachute safely to the ground--Joseph Kennedy, elder brother of John Fitzgerald Kennedy who later became US president. However, the bomber exploded in the air while still over England, and Joe Kennedy was killed. The author is grateful to Dr. Guy Batteur for sharing material about this site, after a visit to it. 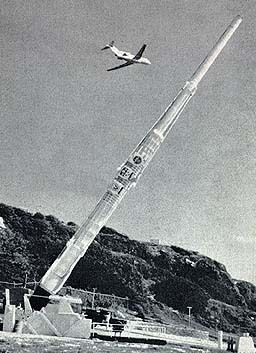 "Big Gun on Barbados" by Peter M. Millman, Sky and Telescope, August 1966, p.64. "Development of Gun Launched Vertical Probes for Upper Atmosphere Studies" by G. V. Bull, Canadian Aeronautics and Space Journal 10, p.236, 1964. "The Development of Large Bore Gun Launched Rockets" by F. W. Eyre, Canadian Aeronautics and Space Journal 12, p. 143-149, 1966. A review of the above two articles by Bruce Dunn. "Bull's Eye--the assassination and life of supergun inventor Gerald Bull" by James Adams, 317 pp. , NY Times Books 1992. Another book: "Arms and the Man" by William Lowther, Presidio Press 1991.